The question is , did anyone try it on omni ? is there WASD support in the game ? I'd be happy to tell you, but I'm still waiting for Oculus to send me a replacement for my RMA'd Rift. That said, the Omni's keyboard support is... uh, lacking. The Connect Software has near-zero configurability, so while setting it to Keyboard mode will work just fine for WSAD input, there's no way to, for instance, have it detect that you are moving a certain speed and automatically hold Shift... ergo, keyboard mode does not support running. I'd love if someone told me I was wrong, but I've wasted hours at this point trying to figure it out and haven't, for the life of me. lol , imagine doing that . anyway I still did not get an answer from anyone , really , does anyone know ? With the full motion patch, probably. As long as the Omni can be set to emulate the x/y axis of the controller, it will be able to, and if not, if the game allows for the use of awsd configuration, yes, but it probably does not. We'll see once the full motion patch is out. I know this isn't a great solution, but there are some 2.4GHz RF number pads (battery powered) available that are small enough to velcro to your arm. Just saying - if you're really desperate. There's also an applicaton (which I can probably find given enough time) that allows multiple keyboards to be treated as separate devices so that the keypad can act completely independently from your real keyboard. If anyone is this desperate, I can probably find the app and post some links to amazon for the keypad I've tried. There's some input in another thread about this with the gist of it being that it's too much work for the average user so pressing a modifier when you pass some foot motion threshold is not a feature. I think that's pretty much (expletive deleted). If you're going to go through the pain and suffering to get a game working with the Omni, you're going to be willing to tune it to work with run speed. We will need game specific profiles and the like, of course. For anyone interested also I've been taking a look at the other half of the equation - the output of the Omni SDK is yaw, x-axis and y-axis values as well as a step count. That would provide input for the OpenVR plugin to create a world offset for the Vive. And finally - if there's whose already received an Omni and has basic C development skills, I can tell you which bits need to be put together to make this plugin happen, as it shouldn't be hard. @radiofan Send me a DM, that's something I can implement. For everyone else: So as of right now the Omni does NOT work with Arizona Sunshine. The problem is that the game would need to support simultaneous input from a gamepad or keyboard, and it does not. I'm not sure if XPadder is capable of emulating Touch/Vive controller input, but that would be a good stopgap in lieu of Omni Connect supporting that feature directly (which would be ideal). The problem is that the game would need to support simultaneous input from a gamepad or keyboard, and it does not. I'm not sure if XPadder is capable of emulating Touch/Vive controller input, but that would be a good stopgap in lieu of Omni Connect supporting that feature directly (which would be ideal). thats exactly what I was wondering when I started this topic , thanks for answering the question clearly. hopefully somebody from the devoloper team can read this and gift us keyboard support. If we can figure out how to get the Omni to emulate Touch/Vive controller input, that would solve ALL our problems. I've managed to get Alice VR and Technolust sort-of working after spending ALL DAY messing around with x360ce... but there're some major caveats since games don't tend to like simultaneous input from both a gamepad and Touch at the same time. That said, you really can just run free in the Omni without a hint of nausea. It's damn near miraculous. So the hardware side of things is solid, but the software side needs some serious love. @sami I'm hoping that as more backers (NOT "commercial partners") get their units we'll some improvement in support, but I also worry that burned international backers are going to spurn the product altogether... and if Virtuix has already given up on their own software, that's a huge problem. That said, I'm of the very strong opinion that this thing is just a game controller like any other and expecting DEVELOPERS to individually support your niche controller is the pinnacle of ignorance and foolishness. Can you imagine if every gamepad, joystick, or HOTAS needed native SDK integration? It's absurd and extremely self-defeating. That should cover 99% of current and future full locomotion use-cases, no game-specific implementation required. Hi Veraxus, thank you for your feedback and efforts in this regard. We will look into the Vive/Touch emulation. you are 100% absolutely right , touch / vive controllers stick emulators as inputs for the OMNI is really nessecary , I dont think Virtuix has given up yet on their own software ,they just need more dedication or a better team to do it , because from what I know , the seed invest campaign that they had , raised over 3 or 4 million USD and another 8 million USD from private investors , and If I remember correctly , one of the lines they had said , money will go towards game development and support ! so 4 , 8 and 1 from kickstarter , thats around 13 millions in funds not to mention sales and pre-orders .. with all this money , how are they not taking touch controllers seriously is beyond me. @admin , you really really need to work on supporting games and make super detailed / simple ways to make your device work on legacy games and others. 6 pages of PDF file for GTA5 is ridiculous , I gave up on page 3 , and I really consider myself an expert in the PC field , imagine if some novice person tries to do it .. its just impossible. there has to be a better way to make your device support those games .. like run a .BAT file or .EXE file that does everything for you , its insane how many things a user should do to get the omni to work on a game .. perhaps dedicate some money to make proper game mods/supports for the omni ? you really cannot count on your community to do all the software tinkering for you. your userbase are really small right now. lack of support for one of the two major VR headsets "oculus" is unacceptable , having to flip the cameras 180 degrees before lunching a game and then flipping them again inside a game with the oculus sensors is ridiculous !! am sure if you dedicate 50,000$ in finding a fix for that problem , you will find a fix. 1-easy: make a page with the recommended walking sensitivity to use inside the omni connect for each game ! this would take a day or two of one of your employees to do it but it will save alot of time for all of us ! 2-start making mods , dont care if the game supports modding or not , hard code into the game if nessecary , talk to the developers , pay them good money to patch/update their games to officially support your omni. 3-pay attention to Oculus ! its a 50/50 chance that your user might have an oculus rift and not a VIVE , start supporting touch controllers , and fix the camera sensors issues ASAP. 4-when uploading a video on youtube , with an awsome looking gun or controller holder , how about you share some details about it ? if its custom 3d printed , then share the .STL file to it , so we can print it ourselves and use it ! for people who dont have a printer , they can ask someone to print it for them using 3dprinting hubs. I really do not understand why these details are not shared , and when people ask about them in the video comments , no one answers .. whats the point in keeping them secret ? you are killing yourselves this way. 5-share controllers profiles (xpadder ,..etc) make a dedicated page for this , please dont ask me to go download a controller profile from steam community page , forcing us to buy a steam controller just to get the option to download profiles is crazy. not everyone has a steam controller and we should not buy one just for the sake to download a couple of profiles from steam community pages !! 6-support vive/touch touchpad/stick input emulation into the omni as input , some games use these for movement/locomotion inside the games . not all games uses WASD input , specially if it is a VR game. please dont just "look into it" , you need to DO IT. The solution I'm proposing is much simpler, more reliable and accurate than Vive controller input emulation would be (or WASD) and would support many games that only natively support teleport locomotion. I've sent Veraxus the full details in a DM. It's pretty straightforward for a c++ dev to put together in a couple of days - there's already the Virtuix source code that reads from the Omni, and OpenVR example code that moves the user inside the OpenVR world (try installing 'OpenVR Advanced Settings' and dragging the 'Play Space' sliders in any game to see that working), they just need to be put together into a single project with some calculation of the world offset based on number of steps. what is your kickstarter backer number ? perhaps you can convince @admin to send you your ASAP in order to help them with this stuff. There are ways to emulate a vive controller - the problem is that steamVR will pick it up as a third controller. What Omni needs to do is overwrite the trackpad data on (usually) the left controller. That would enable support for a LOT of new Vive games. I really hope that can happen! If we can figure out how to get the Omni to emulate Touch/Vive controller input, that would solve ALL our problems. from a programming standpoint it would take all of maybe 4 hours to emulate it as there is open source emulator code for it out there already that people use to play vive games with their keyboard instead of the vive wand controllers. (i really hope they change their chance and give it an actually go as they stated in this thread above) In a prior post a few weeks back they responded and basically told me no it's too late to fiddle with that stuff and not feasible this late in production. The walking sensitivity is not tied to the game but to the user, so this is not something that can be done for you. It's there for you to adjust the sensitivity to suit your own individual gait. The default setting should work for most people though. In legacy games where I believe there is a benefit to adjusting the character speed, I provide those values and instructions on how to do it. talk to the developers , pay them good money to patch/update their games to officially support your omni. Virtuix is already working with developers to add support for the Omni - I agree this is very important! an awsome looking gun or controller holder , how about you share some details about it ? I would love for the gun prop to be available as an accessory on the store, so I appreciate people calling out for it. Hopefully it can be added at some point. It is just a prop though, so in the meantime you can still play games without it. share controllers profiles (xpadder ,..etc) make a dedicated page for this , please dont ask me to go download a controller profile from steam community page , forcing us to buy a steam controller just to get the option to download profiles is crazy. I thought I included Xbox xpadder profiles in all my game guides (except for some of the Vive mods perhaps, where they're not needed). The Steam controller profiles were meant as a bonus for those who own the controller - I wasn't forcing anyone to use them, but please tell me if I left one out. "In general, a good rule is to avoid moving the camera unless it’s copying user movement, or this can cause problems with the Vestibular system. Put simply, Vection is the effect of confusing the user’s brain by having conflicting signals sent from the eyes and ears, it can cause the body to assume it has been poisoned, and thus a similar response is evoked - a rejection in the form of sickness. As with everything, there are exceptions, so do experiment and test with as wide an audience as possible to see what works with your game. Currently the most comfortable VR experiences are stationary, usually with the user being seated. As a result, turret-style games are very popular in VR. Traditional first-person character control with mouse and WASD or gamepad frequently induces nausea, so are best avoided. If you do decide to use first person control, test your movement with as many users as possible, and definitely disable head-bobbing. You might want to look into disabling yaw, and instead replace it with snapping rotation, possibly combined with a very quick camera fade. If you do need to implement movement, whether for technical reasons (see the Maze example below) or otherwise, then consider giving the user a constant static visual reference - such as a cockpit, cabin, the interior of a car, or similar." So, while I hope this trend changes, at the moment it looks like the most effective way to get suitable content for the Omni is to encourage developers to use the SDK. Since the Omni is not artificial locomotion (it enables natural head and leg motion), it does not fall foul of these best practice guidelines, so developers are more likely to add full locomotion to their game, explicitly for the Omni. at the moment it looks like the most effective way to get suitable content for the Omni is to encourage developers to use the SDK. That is going to be really hard or nearly impossible , because what gain will the developers get for supporting the Omni ? almost nothing ! how many people actually have an OMNI at their home right now ? 200 ? 300 ? how many of these people will buy the game ? half ? thats like 100 people at best .. looks to me too much effort and time for something that wont benifit them much ! and specially when virtuix decided not to sell to normal consumers , this does not encourge devs at all ! because the consumers with omni will not rise .. they shot themselves in the foot with that decision. I know there is a system that will pay the devs from commercial use of the omnis , to me , I think that system will be hard to impliment , nearly impossible to be fair with the devs. again the amount of omnis available right now , will not encourage any devs at all. Virtuix need to pay GOOD CASH for devs to impliment it now. Before it is too late ! I will keep saying this , a good machine , with no software to support it , is a dead machine. I will have an Omni soon and from what I've seen I'll have to buy/find multiple pieces of software to use in addition to my Omni for me to fully enjoy it and even then I'll have to pretend to jump and run fater as I press a button that actually allows me to. So all I ask is this: If things are really doing as great as they are in China and other international arcades spare a little time and money to give the guys who backed and preordered from you what they want. A better emulation software so we can enjoy both legacy games in vr and games already made for vr. I agree with @Xain , on everything he said , and I disagree with you @admin (jan) , where is it stated that some developers majority of their revenues are from the commercial entertainment market ? even if that is true , the amount of work that they need to do to include the OMNI sdk into their games to the number of OMNIs in arcade centers avaliable for commercial use , cannot be that convenient .... until the number of OMNIs in arcade centers becomes really high , I dont see developers dedicating themselves to include your SDK in their games. so in conclusion , the game support will come , but the question is , when ? I dont see that happening in 2017 ... maybe in 2018. And thats were you had plenty of time before releasing the product to work on. for now , my omni will stay on the corner collecting dust , until some games get official support to the omni. Here's a preview of The Mage's Tale, in development for the Oculus Rift. At about 16:08 they discuss the locomotion aspect. As you can see, it uses a combination of teleporting and warping - you couldn't just emulate the Oculus analog stick, it would feel terrible. I still feel the answer is to encourage developers to adopt the SDK, given the widespread reluctance to enable artificial full locomotion. I understand people are worried about the numbers and how long this will take, but good things take time! understandable , therefore , now is a good time for virtuix to contact devs of mage tale , offer them 10k$ to impliment their SDK. this is the only way to encourage devs .. with money .. they are making the game to sell it and make money out of it , 10k$ is good money for a VR game , but if virtuix are going to tell each dev , hey we have this arcade commercial system that will pay you money when people pay to use our machine in arcade centers and open your game , you will get a whooping 10 cents ! 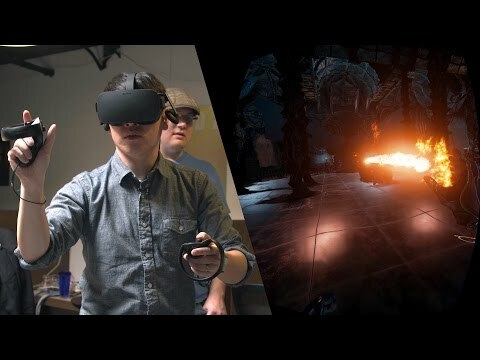 pretty sure they wont bother reading those emails .. virtuix need to offer devs REAL CASH , just like oculus spent MILLIONS on devs just to create VR games ! @admin , if you going to wait for devs to impliment your SDK into their games on their own ... you might aswell be waiting for the return of Jesus , because that is never going to happen , not in our life time. I've been messing with the Omni SDK in Unity recently and it was surprisingly easy to use... however I agree that there is little incentive for most indie devs at the moment. I would suggest Virtuix instead offer "Hey! You use Unity? Why not let us add in Omni support for you, it wont change anything or take up your development time we'll just configure ODTs as an option.". I still feel the answer is to encourage developers to adopt the SDK, given the widespread reluctance to enable artificial full locomotion. Hi RABID, we are talking to many of these game developers, and I believe we'll get quite a few to integrate our SDK. You need to realize that currently most VR game developers make the majority of their revenues in the commercial market, not the consumer market. The consumer market sales are disappointing. However, money is being made by games in VR arcades and gaming centers, especially in China. The success of the Omni in the commercial market gives the developers the incentive to integrate our SDK and earn money for their game via Omni gameplay in commercial locations. In return, our home users will have awesome games to play with their Omni at home. You use Unity? Why not let us add in Omni support for you, it wont change anything or take up your development time we'll just configure ODTs as an option.". I actually think that's a completely viable approach. It should take an experienced developer under 12 hours to add Omni support to a game without any prior familiarity with the SDK... and under 4 hours once they're familiar with it. It's not nearly as complex as a VR motion controller, and it's pretty easy to integrate if you already have locomotion in your game. But to make this work, Virtuix would have to reach out and offer (1) free devkit hardware and (2) free integration expertise. The second one is straightforward enough, but I'm not sure the company is in a place to make good on the first except in rare circumstances.